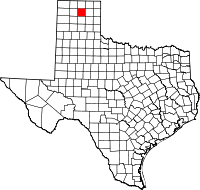 Hutchinson County records are maintained by the Hutchinson County Clerk (http://www.co.hutchinson.tx.us/ips/cms/countyoffices/countyClerk.html), who keeps original copies of vital statistics, with copies maintained at the state level. State records have been kept since 1903. Records kept include birth and death certificates and marriage licenses. Certified copies are provided only to qualified applicants, but anyone can obtain a verification letter. The Hutchinson County Clerk directs patrons to the state website at http://www.dshs.state.tx.us/vs/default.shtm for copies of vital records; a certified copy of a birth certificate costs $22.00; death certificates and marriage certificates cost $20.00 each. Requests can be made online or by mail.